WordBox – game rules. Gameplay – see how to play WordBox on GameDesire! Good with words? Place the letters to create the best! The Wordbox board consists of a 17x15 grid of cells, where players place letter tiles. Up to four players can play the game simultaneously. At the game beginning each player is given seven letter tiles which are drawn from the bag. Having completed a move, a player is given the number of letter tiles which replenishes the seven letter tiles given. 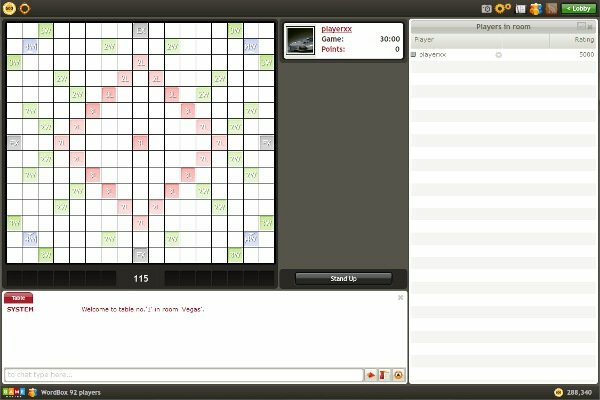 A player's letter tiles are concealed from the opponents. Initially, the bag contains 115 letter tiles. The letter tiles are of different colors, which determines their point values. The number of the letter tiles which are left in the bag is displayed below the board next to the available letter tile field. There are two blank tiles among a player's tiles, which can replace any letter. A player's move is about placing at least a two-letter word using the letter tiles from the rack. The points are scored by summing up the values of the letters that the words which are placed on the board consist of as a result of the move. If letter tiles are placed on the bonus or special cells, the player scores extra points or influences the game in a way. The player who starts the game must place a word so that it is placed on the cell in the center of the board. 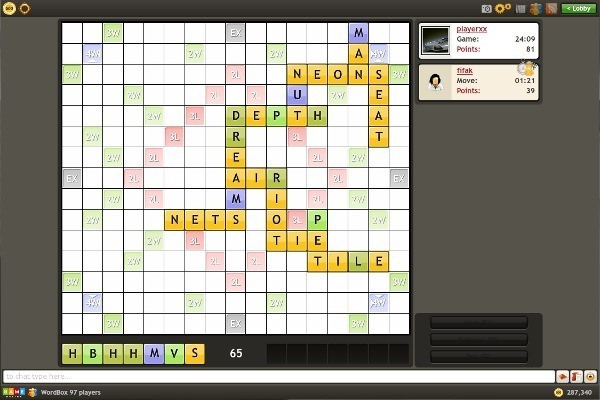 In each turn a player can combine a word placing any number of letter tiles on the board. Words can be accepted by clicking „Make a move” button. Each player is allowed to resign from performing a move by selecting the „Pass” button. Nevertheless, if all players pass twice in two successive turns, the game is over. When a player decides to exchange the letters, they should move the selected letter tiles to the field on the right of the counter of the letter tiles left in the bag as well as select the „Exchange” button. The exchange is only possible when there are at least seven letters in the bag. Each player is allowed to exchange letters three times during one game. They are avalible when you are sitting at the table. Game options - there are bonus options: „Draw” (draw proposition for other player) and „Fold game” (after that you lose game). One of the players has put all the letter tiles on the board and the bag is empty. In this case the player scores extra points for the opponents' letter tiles, but the opponents are withdrawn the number of points which their letter tiles left are valued the moment that the game is over. All the players pass twice in two successive turns. In this case players are withdrawn the number of points which their letter tiles left are valued the moment that the game is over. All the players exceed the time limit. In this case a player is withdrawn the number of points which their letter tiles left are valued the moment that the game is over. if during one turn a player places all the seven tiles, they receive 50 extra points. 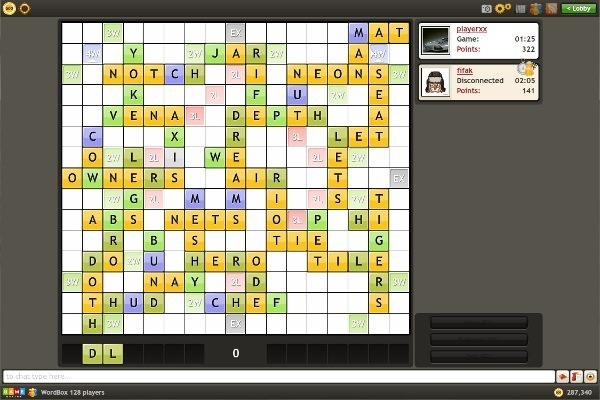 If a player places a blank tile on the board, a letter selection window will be displayed. If a player changes their mind and wishes to change the letter, the blank tile can be double-clicked and a letter selection window will be displayed again. 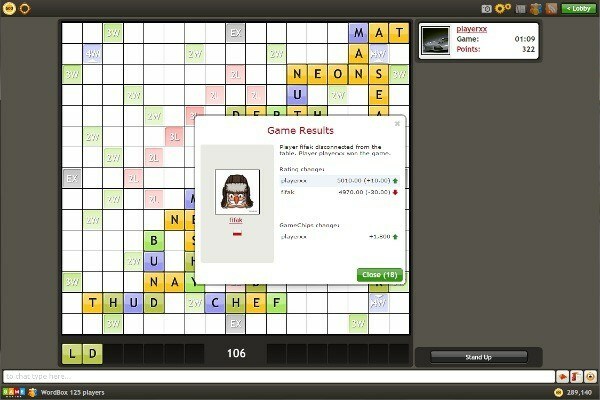 If a player puts the blank tile away, the letter will be removed. while combining words the use of a dictionary is not allowed; it can be used after the word has been combined only, when one of the players questions the word; each word can be used repeatedly during the game.